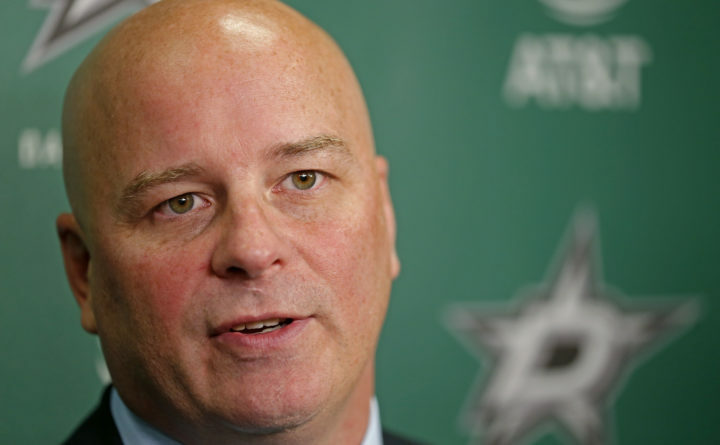 Dallas Stars new head coach Jim Montgomery speaks at an NHL hockey press conference at American Airlines Center in Dallas, Friday, May 4, 2018. Montgomery, the second head coach in three years to go from the college ranks to the NHL, was 125-57-26 the past five seasons at the University of Denver, including a national title in 2016-17. Dallas new head coach Jim Montgomery, center, CEO Jim Lites, left, and general manager Jim Nill pose for a photograph during an NHL hockey press conference at American Airlines Center in Dallas, Friday, May 4, 2018. Montgomery, the second head coach in three years to go from the college ranks to the NHL, was 125-57-26 the past five seasons at the University of Denver, including a national title in 2016-17. Jim Montgomery’s first practice as the head coach of the National Hockey League’s Dallas Stars will be Friday morning at the CenturyLink Arena in Boise, Idaho. The former University of Maine All-American and Hobey Baker Award finalist, who compiled a 125-57-26 record in five seasons as the head coach at the University of Denver, said on Wednesday he has been “champing at the bit for a month or two” to get going. During a busy offseason, Montgomery hired two assistant coaches in Rick Bowness, who has been a head coach for five NHL teams, and former AHL head coach Todd Nelson, the former head coach of the AHL’s Grand Rapids Griffins. “I was looking for hard workers who have had success. Rick has been an NHL head coach and knows all the players and coaches in the league. He has a lot of knowledge. Todd has a very creative mind,” Montgomery said. Montgomery also met individually with each of his players. “The most pleasant surprise was how easy it was to deal with the players. I didn’t see any egos. I saw a hunger to get Dallas back into Stanley Cup contention,” said the 49-year-old Montgomery, UMaine’s leading all-time scorer and the captain of the 1993 NCAA championship team. Dallas went 42-32-8 last season but missed the playoffs. Montgomery retained assistant Stu Barnes and goalies coach Jeff Reese. Former UMaine star goalie Ben Bishop, who is with Dallas, recommended that he keep Reese. “I deferred to Ben. He’s our No. 1 goalie. He has to feel well and play well. He is very important to our team success,” Montgomery said. Another former Black Bear, center Devin Shore, is also with the Stars. Montgomery said one of his primary challenges will getting his players to understand the game plan with limited practice time. “But I’ll be dealing with the highest level of hockey athlete I ever have, so they aren’t going to need as many reps as college players or junior players,” he said. Montgomery likes his roster, saying it was a big reason he was interested in the job. 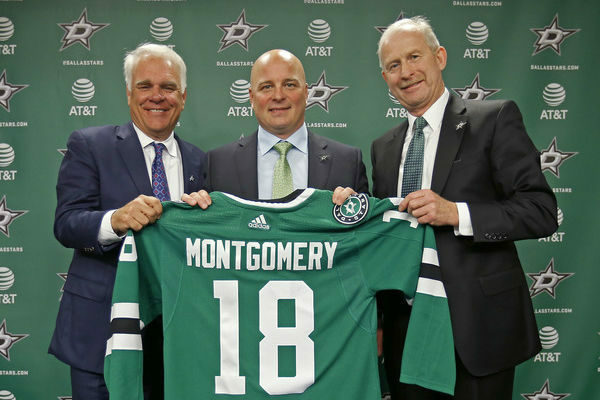 “We have star power, we have size, we can skate, we have a good balance of players in their late 20s and early 30s and a couple of young studs coming up behind them,” said Montgomery, who praised general manager Jim Nill’s vision and management skills. Dallas has seven exhibition games before opening the season against Arizona Oct. 4. While in Boise, home of the Stars’ ECHL affiliate, the Idaho Steelheads, Montgomery plans to have dinner with former UMaine linemate and Boise resident Cal Ingraham.